Sleep is an ubiquitous behavior throughout the animal kingdom, yet the role and amount of sleep required varies greatly among species. The Keene lab uses Mexican cavefish to study the evolution and neural circuits that underlie the role of sleep. A type of antibody, tERK, is shown in purple in a six-day-old fish brain. Populations of dopamine neurons that regulate sleep are shown in green. James Jaggard, a graduate student, took this image. The work of neuroscientists takes them deep into the structures of the brain, exploring neurons, nerves, neuronal circuitry and even single synapses. 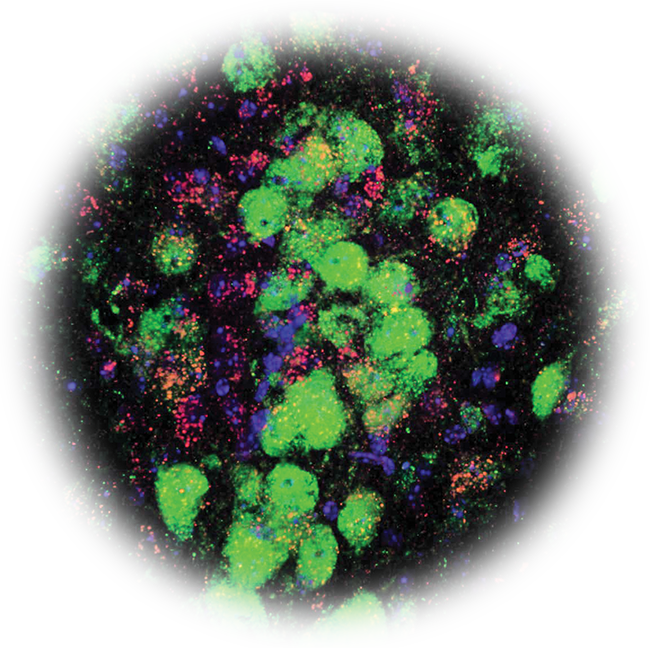 They do this work with high-powered microscopes that allow them to peer into what drives everything from memory formation to the development — and possible treatments — for many diseases of the brain. The images produced by these microscopes are often vivid and colorful, and can be considered works of art in and of themselves. United States and 21 worldwide. Nikon partners with select universities and research centers, providing their scientists and trainees access to high-end imaging technology. We asked scientists of the FAU Brain Institute to share some of the images that they are generating in their studies of the brain. The original images, gathered by Jana Boerner, Ph.D., managing director of the Brain Institute Cell Imaging Core, have been enlarged for publication. The fruit fly is a powerful genetic model used to study nervous system development and function, as well as learning, memory and behavior. Maria Yurgel, a graduate student who took this image, studies the interaction between fly metabolism and sleep. 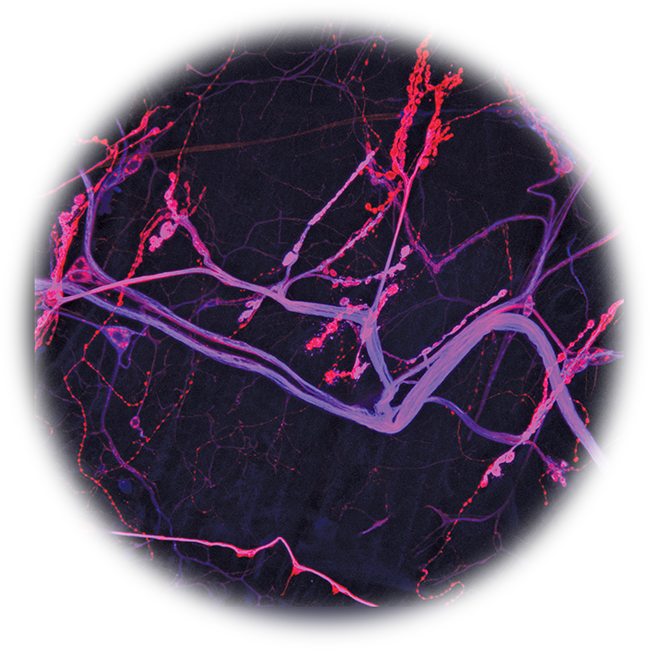 Brain synapses with an antibody are shown in magenta. Neurons expressing a leptin homolog that regulates feeding are shown in green. Doctoral student Chelsea Gibson uses nematode C. elegans, a roundworm, as seen in this photo of her research. The dopamine neurons in the worm’s head show up in green. The cells surrounding the neurons are red. Dopamine neurons degenerate in Parkinson’s disease and Gibson’s imaging studies have revealed mechanisms required to support the health of dopamine neurons. This image taken by Sirisha Madem, Ph.D., a postdoctoral fellow, shows the neuromuscular junction of a Drosophila melanogaster (fruit fly) larva. The larva nerve terminals are shown in string-like red strips, while the protein neuroglian appears blue. The overlap of the two shows up in purple. Neuroglian is similar to the human protein, L1CAM, which is associated with several human neurological disorders. A high-power image of a mouse brain shows serotonin neurons in green (patchy green areas), juxtaposed with signaling enzyme (p38alpha MAPK) stained in red. The enzyme regulates serotonin and coordinates the ability of immune pathways to alter mood. The cells’ nuclei are stained blue. Matt Robson, Ph.D., took this image. This tree-like image shown in green, neurons in the mouse midbrain synthesize neurotransmitter serotonin. These neurons send dense projections to other brain structures to modulate mood, appetite and reward. Matt Robson, Ph.D., took this image as part of his work revealing new ways serotonin neurons are regulated by inflammation.